Create a commercial for Wera, the 'Tool Rebels'. Due October 19th, 2018 - This video contest, hosted by SPOTROCKER, is all about Wera brand and the Wera Tool Rebels. Wera is a globally active, medium sized company from Wuppertal, Germany, and one of the leading manufacturers of screwdriving tools with more than 3,000 different tools. But, most importantly, Wera itself is different – very different. Wera is rebellious and is constantly shaking up the tools industry. That’s why they are, inspired by their customers, called as “Tool Rebels”. Because they develop astonishing product solutions with superior product quality. What should be achieved with the commercial? A successful SPOTROCKER campaign was already executed back in 2017. The aim there was, that the videos should spread and reinforce the Wera Tool Rebel Fever worldwide – and this is precisely the aim once again in this campaign. This time however, with the proviso that the stories or creations in the videos should be linked to specific occasions / public holidays / seasons or should be particularly suited to one of the following occasions / public holidays / seasons: Christmas, Easter, Fathers’ Day/Mothers’ Day, Valentine’s Day, Halloween, birthday, spring, summer, fall, winter. So pick one of these circumstances/conditions and build the core and/or fringe characteristic(s) into your story/creation, or at least ensure they are recognizable in the approach adopted for your video. Please note: If your idea/story/creation should not be able to incorporate any reference to one of these circumstances at all, it could be possible in individual cases to accept such a video as well. 1. First and foremost, your video should have high viral potential. Formulated in an exaggerated way, the primary aim is for the video itself to be spread spontaneously and thus for the Wera brand and the concept of Wera Tool Rebels to be conveyed so that they make an impression. This means a particularly important objective lies within your video itself. 2. Your video should infect new interested parties with the emotional and rational Wera enthusiasm so that they want to be part of the Tool Rebels. So to say it briefly in other words: Wera is ingenious, aesthetic and rebels at any time – at every opportunity! Create a rousing commercial that turns an occasion into a Tool Rebel highlight! To learn how SPOTROCKER works, click here. Your video should be between 20 and 120 seconds in length. Additionally, 6,000 € of production budget are provided as well, which means that videos even get rewarded before the final awarding. Plus: Until 08/08/18 you can additionally participate in the 1,000 € Ideas Contest. Open to SpotRocker community members (it's free to join). 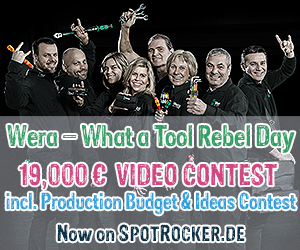 This video contest, hosted by SPOTROCKER, is all about Wera brand and the Wera Tool Rebels. Wera is ingenious, aesthetic and rebels at any time – at every opportunity! Create a rousing commercial that turns any occasion into a Tool Rebel highlight!